Engineering basically refers to the technical application of the design and implementation of structures, systems and processes. The importance that engineering plays in our daily lives is so integrated, we often don’t appreciate its existence. This makes it essential to check out the do’s and dont’s of your next development or construction, before you get started. The Huon Valley Council provides specifications on almost anything that requires construction or development. This can include crossovers, storm water drainage, road construction, subdivisions and much more. Specifications are extremely important, as they detail the dimensions, materials and preparation necessary to ensure your development complies with the Councils requirements. Check out the specifications available or contact us for help. A crossover is the vehicle pathway that connects your property to the edge of the road and includes the kerb and channel, it is the portion of your driveway that is located within the road reserve. In Tasmania, the owner of the property is responsible for providing and maintaining the driveway crossing and the Huon Valley Council is responsible when damage to the crossing is caused by Council’s works or if the Council’s services need replacing. There are different types of crossovers, each with their own specifications, including dimensions, materials and preparation. It’s important to get it right from the outset, as non-complying crossovers usually require rectifying at your expense. As a general guide, the information found here will help you design and construct your new or amended driveway crossover. You are required by law to maintain the stormwater pipes, gutters, downpipes, stormwater pits and any other components of your approved stormwater drainage system in a good condition and in compliance with the Council’s requirements. Some properties are not connected to public stormwater, in which case you will be required to manage stormwater on your property. There are numerous disposal systems such as soakage trenches or tanks. Different soil types, groundwater levels, and other factors will affect the most appropriate method of disposal, which is why a suitably qualified person is required for design of such stormwater systems. Stormwater for new developments is assessed against the requirements of the Huon Valley Interim Planning Scheme Stormwater Management Code (E7.0). Standard drawings are two-dimensional (ie flat), technical illustrations of objects or structures. They can help to speed up the approval process for your development, as they accurately detail dimensions and other important information about your structure. The three regional Council groups (Cradle Coast Region, Northern Region and Southern Region) with the assistance of the Tasmanian division of the Institute of Public Works Engineering Australia (IPWEA) have developed a suite of Standard Engineering Drawings for use by Local Government in Tasmania. Details include roads, accesses, storm water connections and much more. The Standards are available from Council directly or on the Local Government Association of Tasmania website. The Huon Valley Council has adopted the “Tasmanian Subdivision Guidelines” developed by a joint project of Tasmanian Local Government Authorities. 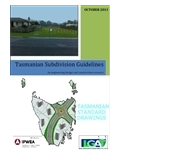 These guidelines provide information on the minimum standards required by participating Tasmanian Councils for the design and construction of roads and utilities as per the relevant statutory requirements (including Urban Drainage Act 2013 and Local Government Act Highways 1982). Additionally this document outlines the process to be followed during the construction of civil works; audit inspections, practical completion of works, defects liability period and final take-over of the roads and civil works. It is intended that this guide be used by developers, construction contractors, design/supervising engineers as well as consultants and senior management.